Interview with curator Jorn Konijn on Asger Jorn’s “advertisement monster”, the ban on billboards in São Paulo, São Paulo’s local politics, and art. While interviewing Ruth Baumeister for this blog I was reminded of one of Asger Jorn´s statements on advertising: “If artistic or overarching human cultural values are to be developed, this can only happen at the same time as greater and greater restrictions are placed on the roar coming from the advertisement monster and its appeal to rampant individualism.” (From: Façade-Art – Towards a New Architecture, 1950). I asked Ruth about the ban and its effects on the city’s architecture, or rather the (collective) experience of it. My question resulted in a series of relevant and critical questions from Ruth’s side, and from there in an interview with independent curator and consultant Jorn Konijn. HdB: Jorn, could you briefly explain your relationship to São Paulo first, and your experience of its local political landscape? JK: My relationship with Brazil, and in particular with São Paulo, dates back to roughly 10 years ago. First, I went there as a tourist, visiting friends, later I lived and worked there part time. I mostly work within the field of culture, as a curator and project manager of cultural projects. Brazil’s local political landscape is very fascinating. It’s on the one hand still very traditional and patriarchal. Especially in the North of Brazil one feels being thrown back to a few centuries ago where a few families control the city. Both São Paulo and (back with a vengeance) Rio de Janeiro are extreme power bases, operating seemingly independent from the federal government in Brasilia. Its ruling party – the PT, the socialist party – is one with huge power which results in typical large scale problems of for instance corruption. Religion is also extremely powerful which results into strange political alliances. For instance, in the last presidential elections Green Left candidate Marina da Silva created an alliance with the Evangelic Movement, an extremely conservative religious movement comparable with America’s Born Again Christians. Strangely enough, the former Mayor of São Paulo Kasab was an independent candidate. HdB: Could you summarize the facts about the ban? When and by whom was it issued? 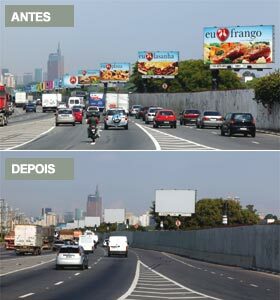 JK: The ban on billboards in São Paulo was actually not that much of an extremely discussed or fought over decision. I personally only noticed it when it was being pointed out to me by friends. The decision was made by former Mayor Kasab. One of the main theme’s in his election was the liveability of the city. Unlike Rio, São Paulo does not have much natural beauty and many people refer to the city as one made out of concrete and cars. Kasab tried to improve the liveability by removing all the billboards in the city. Smaller signs located on the facade of a shop are still allowed. Once it is pointed out to you that the signs are gone, you actually do notice a striking difference. One specific industry was not very happy with the decision which was of course the advertising industry. They suffered a huge blow with the ban, which resulted in the job loss of many. HdB: How about the political motivation? The reporter in this short film http://www.youtube.com/watch?v=U1Nmnv0Ospg claims that the law was originally proposed by a left-wing political party, and the motivations of the Mayor that received the credits for it are questioned. JK: As far as I know it really is Kasab’s law. Left wing political parties are not very strong in São Paulo, which is the liberal economic powerbase of Latin America. Rightwing-liberal parties seem to dominate local politics; only recently São Paulo has chosen a socialist mayor (Fernando Haddad), the successor of Kasab. Haddad appointed new Ministers for Culture, two left-wing powerhouse politicians (Juca Ferreira and Marcello Araujo). He also appointed a State Secretary for Urban Planning and Urban Affairs (Fernando de Mello Franco, an important architect in São Paulo). All and all the appointing of these figures seem to create a very interesting political framework in both the city and the state of São Paulo. This will undoubtedly keep the ban on billboards and will surely implement other actions for further improvement of the life in the city; the regeneration of Sao Paulo’s downtown (including dealing with São Paulo’s most horrifying drugs area – Crackolandia) will surely be dealt with. I must add that many of these actions were already started by liberal state council man Carlos Augusto Calil who left office last year. HdB: What can you tell about the visual impact of the ban? Some people that I know have been to São Paulo, and told me that the city still looks like it is overloaded with adverting. On the internet I found a ‘before and after’ video’ http://antiadvertisingagency.com/sao-paulo-before-and-after/that seems to present quite a spectacular difference … . How would you describe the visual transformation? JK: I personally always enjoyed São Paulo. It’s actually a very liveable and surprisingly green city. Yes, the city has problems (the notorious traffic and the disastrous flooding situations during heavy rains) but overall it is a city that is both pleasant to live and work. The billboards can feel very much in your face, so yes, the city looks more calm now. I however could every once-in-a-while also appreciate São Paulo’s crazy creative advertising. The billboards were often highly entertaining with (literally) going outside the box. 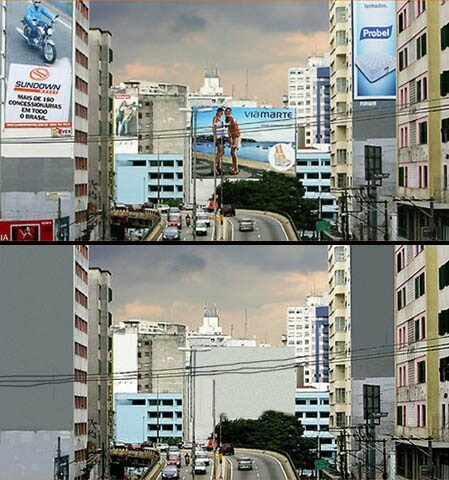 The creativity of many billboard advertising was surprising. JK: Advertising agencies still try to occupy public space in different ways: advertising in busses, subways or actually physical people carrying signs and walking or standing around with signs hanging on their bodies or waving huge flags trying to lure in customers into their shops. But also, the ban on advertisement resulted in more mural art-work to fill the empty spaces that were left with the removal of the billboards. 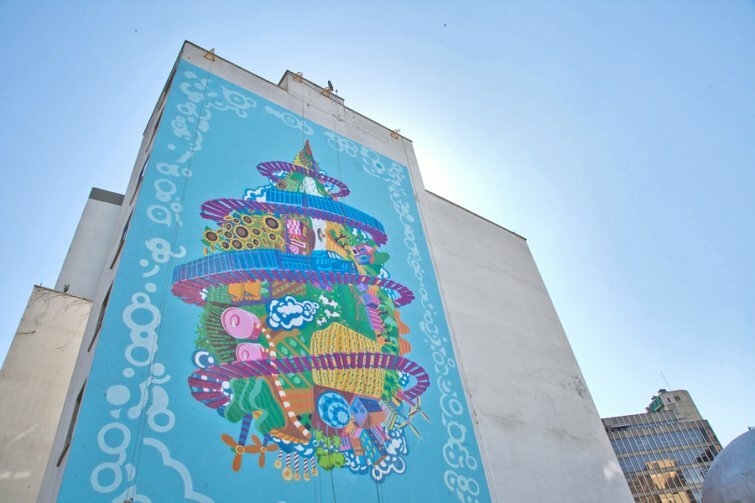 The city government started a cultural program which is called Cidade Limpa (clean city) in which they commission local street artists to create giant murals. Some of them, especially those of graffiti artists such as Os Gemeos and Tity Freak, have become landmarks within the city. 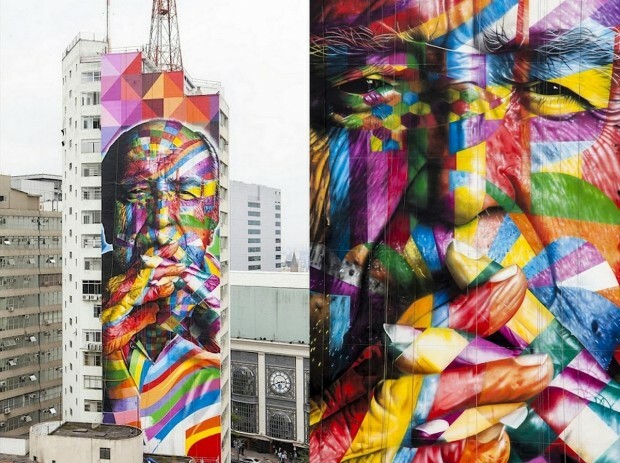 São Paulo’s latest mural tribute to the great Brazilian architect Oscar Niemeyer forms another important landmark. HdB: Asger Jorn believed that artistic or overarching human cultural values can only be developed collectively. Captalism’s individualism would be in the way of that, and commercial advertising would enhance this sense of individualism, of thinking of ourselves in the strictest sense of the word. Would you tend to agree upon that, and hence regards the ban on billboards a good thing? 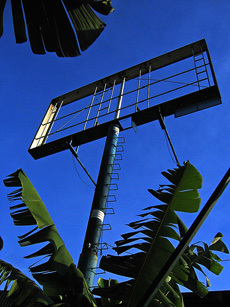 JK: A lot of things are said and written about São Paulo’s ban on billboards. I don’t think it is either a good or bad thing. One thing that I find fascinating about it, is the fact that a (local) government is actually strongly concerned with the liveability of the city and also dares to take radical actions to improve this. In many parts of the world one can see governments heading in the complete different direction, pulling back from a subject like this. For instance by selling it’s city public space to private parties… or perceiving policies for urban strategies only by creating the next iconic architectural landmark. In São Paulo actions like this are being undertaken as if it is the most normal thing on earth. This entry was posted on Friday, May 24Architecture. You can follow any responses to this entry through the RSS 2.0 feed. You can leave a response, or trackback from your own site.